Andrea Gabrieli is one of the major musical figures of the late 16th century. Although he spent a large part of his life as an organist in San Mark's, Venice, he is distinguished by his broad palette of styles and musical genres within his substantial compositional output. It can rightly be asserted that Gabrieli was the first Italian composer of international stature who primarily achieved his reputation on the strength of large-scale polychoral compositions. His significance additionally rests on his lasting effect as the teacher of an entire generation of musicians who then guaranteed the dissemination of his style across the south of Germany. 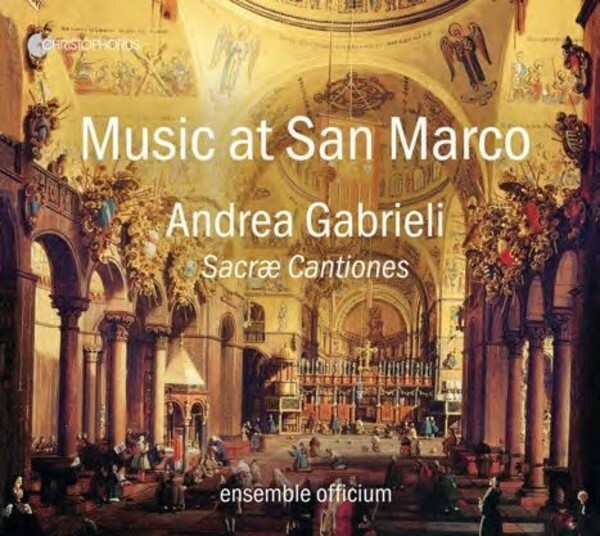 Gabrieli�s early compositions such as the 'Sacr� Cantiones' dating from 1565 are without doubt influenced by the works of Lasso, with whom a lifelong friendship connected him. Orlando di Lasso had indeed published a set of motets in Munich and Venice only two years before Gabrieli, also entitled 'Cantiones'. One is left with the suspicion that Gabrieli was entering into competition with Lasso with his collection of works and was seeking comparison with his fellow musician, a customary practice during this period. Gabrieli impressed not only through his excellent mastery of classical vocal polyphony, but also with compositions distinguished by a new simplicity generated by a close adherence to the comprehensibility of the text. His works were very much forward-looking, already anticipating the tonal language of composers such as Hans Leo Hassler and Melchior Franck.